Commercial and Industrial Development - Eklutna Inc.
Eklutna Plaza is a 10-acre parcel strategically located between the Old and New Glenn Highways and is a build to suit site at the busiest intersection in North Eagle River. This site will brand North Eagle River exit as the heart of Eklutna, Inc’s land holdings. This commercial site is suitable for a multi-use development. The Corporation is exploring the retail, commercial and Class A office building markets. This will also be the site of Eklutna’s future headquarters. 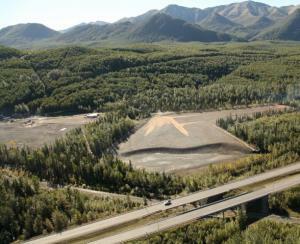 In 2012, Eklutna, Inc. leveraged an affordable option for filling and grading the Plaza location. Site-clearing, grubbing and filling was completed in summer 2012. Architects Alaska was awarded the design contract for the project in late 2013; and the design is anticipated to be completed in 2014. This site will brand North Eagle River exit as the heart of Eklutna, Inc.‘s land holdings. This 155-acre development is a key lynchpin for the future of Eklutna,Inc.‘s industrial development projects. Although other corporate lands are zoned for industrial use, none are as valuable as this site. With the adjacent railroad spur and the market’s lack of industrial zoned land, this location has been a focus for many industry leaders. Birchwood Industrial Park is one of three Foreign-Trade Zones (FTZ) within the MOA; the other two FTZs are the Ted Stevens Anchorage International Airport and the Port of Anchorage. The site’s designation as a FTZ will provide benefits and added value for goods shipped to or from global markets. the gravel removal from the site has been completed, the final site work has been finished, the Municipality of Anchorage has closed-out the Conditional Use Permit; and the site is ready for occupancy. Marketing of the site has commenced in conjunction with the Alaska Railroad Corporation. Currently a portion of the site is leased out for a construction mobilization yard with other contractors interested in this location. This site is available and well suited for logistic intensive projects. 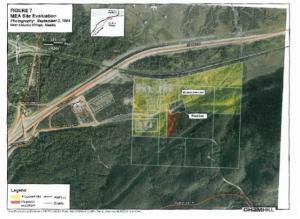 Eklutna, Inc. has significant holdings of other industrial lands ranging from North eagle River Past Eklutna Village. These lands are highly valued due to the fact the MOA has limited industrial land inventory. In 2009, the MOA commissioned a study that identified the Corporation as the largest holder of industrial lands. Eklutna, Inc. owns most of the remaining or developable commercial and industrial land in the Municipality of Anchorage. This is a prime commodity and enables the Corporation to lease the land, design/build a facility, and/or sell the property. Existing leased properties include partnerships with companies like Office Depot, Spenard Builders Supply, Alaska Communications Systems, AT&T Cellular, and the federal government, General Services Administration managing the lease terms for the Federal Bureau of Investigation headquarters in Alaska. In certain, advantageous situations, commercial land held by the Corporation may be sold. For instance, the Fred Meyers site in Eagle River, brings an anchor franchise to enhance and promote the development of adjacent corporate lands. This decision was pivotal in the Corporation’s long terms plans to develop that location as the new primary and desired location for Eagle River commercial development to expand. Since the completion of Fred Meyers, multiple medical industries have constructed facilities adjacent to the Fire Eagle site. The Corporation has several more commercial lots for lease near the Fred Meyers property called Northgate and Fire Eagle. Long term ground leases are a core revenue stream anticipated to be a growing segment in the overall business model. In 2007, the Corporation signed an agreement with the Municipality of Anchorage for a significant land trade. The Mt. Baldy Land Trade, traded 80 acres of frequently hiked mountain top overlooking Eagle River for 20 acres of park land. The Corporation received 20 acres in Edmonds Lake Park and cash in consideration of the value of the 80 acres. Realizing the value to the community of this land trade funding came from appropriations approved by the Alaska State Legislature. The final closing was June 2008. Additionally, the Corporation continues negotiating in discussions for significant land trades with the Alaska Railroad Corporation and with the Municipality of Anchorage. The anticipated, successful completion of these discussions will markedly increase the assets of the Corporation. Eklutna, Inc. has enlisted Nvision Architects to prepare plans for one half of the five (5) acre site at the corner of Artillery Road and Mausel in Eagle River for Phase 1 of a light industrial shop space development project. Phase 1 will consist of two (2) buildings totaling 30,000 square feet. The design includes store fronts facing each other with store front parking and rear entrances including overhead doors to the shop/storage space. Construction began Fall 2014 and Artillery Park opened in Spring 2015. In the summer/fall of 2008, Matanuska Electric Association (MEA) approached the Corporation regarding an interest in approximately 72 acres of corporate owned land. The land location for the development of a natural gas power plant is off the Old Glenn Highway by the Reed Substation. It is actively under development for a natural gas power plant. Due to their strategic locations, the Corporations lands have had a long history of supporting infrastructure related to the power grid system for Anchorage and the Mat-Su Valley. In summer 2012, MEA broke ground on the Eklutna Generation Station (EGS). In a separate agreement, MEA signed a ground lease with the Corporation, for the land adjacent to the EGS. This land was cleared and used as a staging area for the construction project. Construction of the facility was completed in late 2014 with the power plant coming online and active in January 2015. The 107 acres of Eklutna, Inc. land surrounding the Eklutna Generation Station has been re-zoned to I-1 (light industrial) and I-2 (heavy industrial) zoning to be able to accommodate future industrial growth. Other industrial ground leases have been secured as a result of the rezone and the area continues to attract interest from other potential clients.